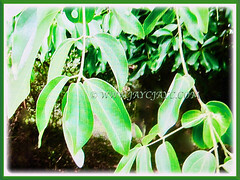 Ceylon Cinnamon Tree or Cassia Cinnamon is widely cultivated for its aromatic bark and leaves. It is an exotic and popular spice that is used in both sweet and savoury foods. Besides, it is a vital ingredient in apple pies, madeira cakes, doughnuts, pastries and biscuits. 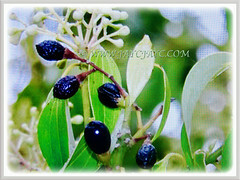 Botanical Name: Cinnamomum verum (syn. 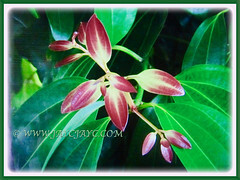 : Cinnamomun zeylanicum, Cinnamomun alexei, Cinnamomum bengalense). 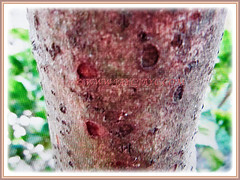 Common Name: Cinnamon, True Cinnamon, Ceylon/Cassia Cinnamon, Cinnamon Bark Tree, Kayu Manis in Malay. Etymology: The genus Cinnamomum is from the Greek word Kinnamomon meaning spice. The specific epithet verum means true or genuine. Origin: Native to India, Sri Lanka, Bangladesh and Myanmar. Plant type: An ornamental, evergreen and perennial tree. Features: Cinnamomum verum is from the genus Cinnamomum that consists of over 300 species of plants. The old botanical synonym, Cinnamomum zeylanicum is derived from Sri Lanka’s former name, Ceylon. Cinnamomum verum is a stout and evergreen tree with thick grey bark and low-set branches that can reach between 9-15 m in height and spread between 14-18 m wide. 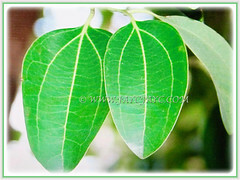 The aromatic 5-18 cm long and 3-10 cm wide leaves of the tree are thick and oval to elliptic in shape, growing on smooth gray branches. The petiolate dark green adult leaves are arranged opposite along the stems and are rather stiff with three yellow veins from the base to the tip. Young leaves tend to be pinkish to reddish. The tree produces clusters of inconspicuous, small and star-shaped, creamy-yellow to white flowers that are borne on axillary and terminal panicles. The flowers have a distinctive odour. 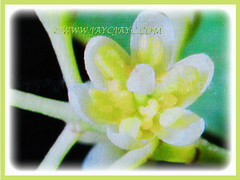 Each flower is about 3 mm wide. The fleshy, ovoid and inedible fruit is a purple 1.5-2 cm drupe containing a single seed. 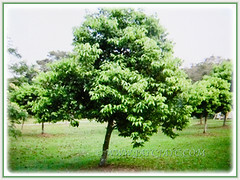 Cinnamon trees have an economic lifespan of approximately 10 years. 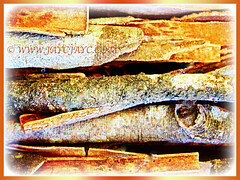 The spice is made from the tree’s curling inner bark. 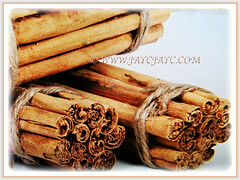 Cinnamon is cultivated by growing the tree for two years, then coppicing it, i.e. cutting the stems at ground level. The following year, about a dozen new shoots form from the roots replacing those that were cut. Culture (Care): Cinnamomum verum or Cinnamon Bark Tree can be grown easily with least maintenance. Light: Full sun but will tolerate some shading. Moisture: Medium water requirement. It benefits when grown in a high humid environment. Soil: Best in humus-enriched and sandy soils to obtain the highest quality bark. However, it has adapted to a wide range of soils. Others: The Cinnamon Bark Tree can be pruned to maintain a maximum height of 0.9-2.4 m.
Generally free from serious diseases and pests. Nevertheless, a number of pests such as Cinnamon gall mite (Aceria doctersi), Diplodia spp., Colletotrichum gloeosporioides and Phytophthora cinnamomi (Stripe canker) can affect the growing plants. Cinnamomum verum or Cinnamon Bark Tree is a tropical plant and grows best in warm areas with high humidity where average temperatures reach approximately 27°C. It handles mild frosts down to 0°C but needs protection from harder frosts. Propagation: Easily propagated from seeds that usually germinate in about 20 days and they have to be planted soonest as they do not remain viable for long. It can also be propagated vegetatively from cuttings or by air layering. Usage: Cinnamomum verum or Cinnamon Bark Tree is ideal to be planted at public parks and gardens as an ornamental or specimen tree. An excellent aromatic spice that is used in both sweet and savoury foods. 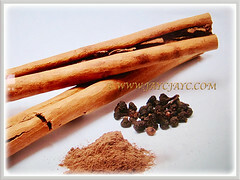 Pieces of dried cinnamon bark or ground cinnamon are used as a flavoring in baked goods, confection or savory dishes. The bark of this tree is used as a spice seasoning for meat, sauces, baked goods and drinks. Oil extracted from the leaves is used as a flavouring agent in snacks. Oil extracted from the bark and leaves is used as a flavoring or scent in perfumes. It has been prized for its many health properties. It is loaded with powerful polyphenol antioxidants and anti-inflammatory properties that helps the body to fight infections, repair tissue damage, reduce risk of heart disease, as an anti-diabetic and lowers blood sugar levels. Besides, it has medicinal benefits where the oil is extracted from the bark and used in pharmaceutical and dental preparations. A magnet to attract birds and a butterfly food plant.